Takao Shinji (高尾 紳路 Takao Shinji, born 1976) is a professional Go player. As Honinbo, Takao has taken the name 秀紳 (Shushin). Takao scored 900 wins at the youngest age (38 years old) and in the shortest term (23 year and 8 months), defeating Yamashita Keigo 9p by half a point in the Meijin league tournament on 25th December 2014. He became the 21st player to win 900 official games (*against 385 losses) in pro tournaments. On November 3rd, 2006, Takao won the 31st Meijin tournament from holder Cho U by 4 games to 2. Two of his four wins were by half a point. On June 28th, 2005 Takao won the 60th Hon'inbo tournament, and his first big Japanese title, from Cho U, in a match that lasted five games. Its final game was won by a mere half a point. Bob McGuigan: On the Mainichi newspaper web site there are some comments about Takao and his success in the Honinbo match. Takao's win is ascribed to his thick style, transmitted from his teacher Fujisawa Hideyuki. 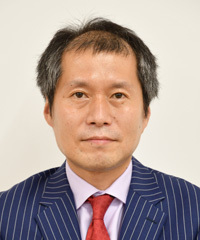 It is mentioned that he is joining Cho U, Hane Naoki, and Yamashita Keigo at the top, and that these players are being called the "Four Emperors". hnishy "Shi-tennou" means four gods guarding Buddhism, not emperors. Please read https://en.wikipedia.org/wiki/Four_Heavenly_Kings. Strange Pro Opening 3 features a game between Takao and Yamashita Keigo. These two have been rivals since at least August 1986 when the 9-year-old Takao lost on national television to the not-quite-8-year-old Yamashita in the final of the All-Japan Elementary School Championship. In 1996 Takao beat Yamashita in the semi-final of the 21st Shinjin-O Tournament and then went on to sweep the title match from Nakamura Shinya 2-0. In 1998 Takao played Yamashita in the final of the 23rd Shinjin-O but lost 1-2. On 2003-01-16 Takao beat Cho Chikun to win the losers' section of the Judan tournament. As a result, he will play the winner of the winners' section to see who will challenge O Rissei for the title. His opponent? Yamashita Keigo, of course! Dave. Takao performed quite well in junior and lightning tournaments. His teachers are Taoka Keiichi and Fujisawa Hideyuki.